Manufacturers are continually striving to improve product and process quality and reduce part variation in their processes. The fact is variation exists in every manufacturing process. The common method that many design engineers use to address variance is to assign a tolerance range to their print dimensions. The manufacturing processes are then monitored through the application of Statistical Process Control (SPC) methodology including regular data collection intended to keep the process in a “state of control”. The success of any SPC system depends upon precise and accurate data. Unfortunately, all measurement data contains a certain percentage of variation. The variation is the difference between the true values and the observed values. The variation represents the amount of measurement error. In addition to measurement error, is the actual product or process variation. When we combine measurement error with product or process variation the resulting value represents the total variation. To assure that our measurement data is accurate we must determine if the amount of variation is acceptable. An effective tool for evaluating measurement variation is Gage Repeatability and Reproducibility (Gage R & R). Within any quality system there is variance in measurement data. Within all manufacturing processes, there is variation. All measurement data has some degree of variance or errors. A robust SPC process requires accurate and precise data to have the greatest impact on product quality. Being quality professionals we need to determine what percentage of variance is due to the measurement system. Gage Repeatability and Reproducibility is a proven method for evaluating the capability of a measurement system. A Gage R & R study examines repeatability of the equipment and reproducibility of the appraiser. 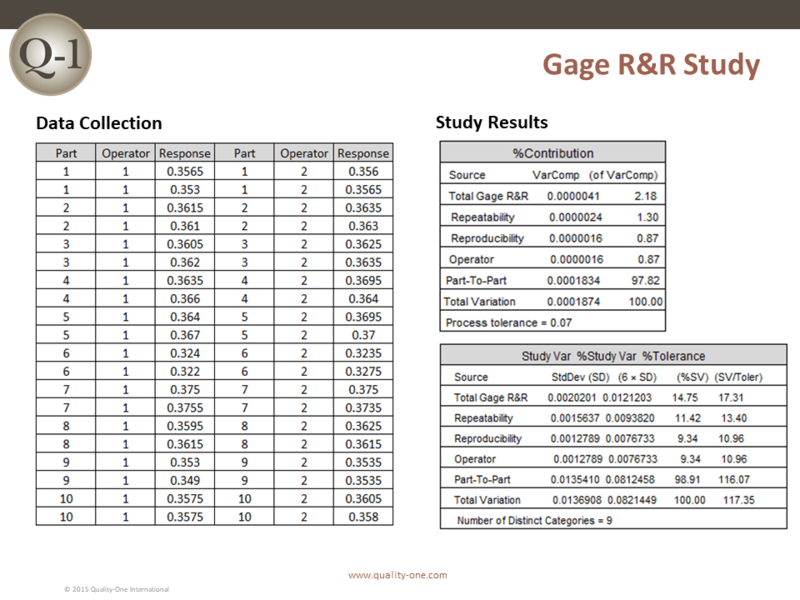 Understanding Gage R & R allows us to predict the percentage or probability of measurement error and understand the source of the variation (equipment or appraiser). Through determination of where the variation in the measurement system exists, we can take appropriate action and improve the quality of our data. Better data leads to better decisions, fewer errors and higher quality. The ANOVA calculations are more complex but the ANOVA method is also able to distinguish relationships between the appraisers and the part. Many practitioners use software programs to perform the necessary calculations and most of them include ANOVA. Using this information, we can identify any major contributors to variation in our Measurement System Analysis (MSA). When performing a Gage R & R study, it is vital that the data be random in nature. It is standard practice to have multiple appraisers measure the same set of parts in a random order. It is common practice to use two or three appraisers and 5 or 10 parts. The purpose of this study is for example only and not an analysis of the process. In this study, two appraisers / operators measured a set of ten parts two times in random order and recorded the data. The parts were representative of the entire range of process output. The measurements for the study were taken using digital calipers. The unit of measure is decimal inches. The results of this study using include % Contribution, % Study Variance and % Tolerance statistical reports. Each of these statistics provides valuable information; how you interpret each of them depends on the purpose of the study. 10-30% = Acceptable dependent upon method of measurement, application, etc. 1-9% = Acceptable dependent upon method of measurement, application, etc. In conclusion, the % Tolerance results indicate that the measurement system is capable of detecting a non-conforming part. The data results of our study indicate no apparent problems with our measurement system. For further examination, the data can be interpreted through graphical analysis methods. In the Scatter Plot, the individual measurements are plotted as part by appraiser. The scatter plot can give more insight regarding the consistency between the different appraisers, highlight part-appraiser interactions and provide evidence of any outliers. In reviewing this graph, it is evident that there was not a significant difference between appraisers. The Pareto is a good tool for illustrating the sources and their relative percentage of the total variation. The graph clearly shows that the majority of our variation was part-to-part. A good measurement system should have the highest percentage of variance attributed to part-to-part variation. The R Chart validates the level of operator consistency. If operators measure the parts in a consistent manner, the ranges will be small relative to the data and the data points should fall within the control limits. As you can see, the data points fall within the limits and the range is very small, indicating that the operators or appraisers measured the parts consistently. The Xbar Chart evaluates part-to-part variation to the repeatability factor. This graph indicates the patterns of the two appraisers are similar. This information supports the previous conclusion that the measurement system is effective. The Response by Interaction graph identifies whether or not the interaction was significant. This part to operator interaction is not available using the Average and Range method. The chart displays the average measurements by each operator for each part. The lines connect the averages for each operator. The graph shows both lines following almost identical paths but operator 2 is measuring the parts only slightly higher. In addition, the difference between part averages is clearly identified. The operators in the study appear to be measuring parts in a similar fashion. The Response by Part chart plots all of the measurements from the study arranged by part identification number. A line connects the average measurements for each part. In this study, the measurements for each part show little variation and the measurement averages differ enough that the variation between parts is apparent. The Response by Operator Box Plot can indicate if the measurements and variability are consistent amongst the appraisers. The means of each operator/appraiser’s set of data are indicated by the black circles. A horizontal line connects the means from the study. The line is nearly parallel indicating that the appraisers, on average, measured the parts similarly. Had the line not been parallel it would indicate that the appraisers were measuring the parts differently. In summary, the graphic evidence supports the previous conclusions regarding the measurement system and the report findings. In the study, the Gage R & R was acceptable and the variation was mostly due to part-to-part variation. Gage R & R is an effective tool to analyze the capability of the measurement system, the tools and the operators. When you are making decisions regarding your process based upon data, you must ensure that the data is accurate. If the measurement system is not capable of providing good data, you could be making crucial decisions based on erroneous information. Quality-One offers Quality and Reliability Support for Product and Process Development through Consulting, Training and Project Support. Quality-One provides Knowledge, Guidance and Direction in Quality and Reliability activities, tailored to your unique wants, needs and desires. Let us help you Discover the Value of Gage R&R Consulting, Gage R&R Training or Gage R&R Project Support.